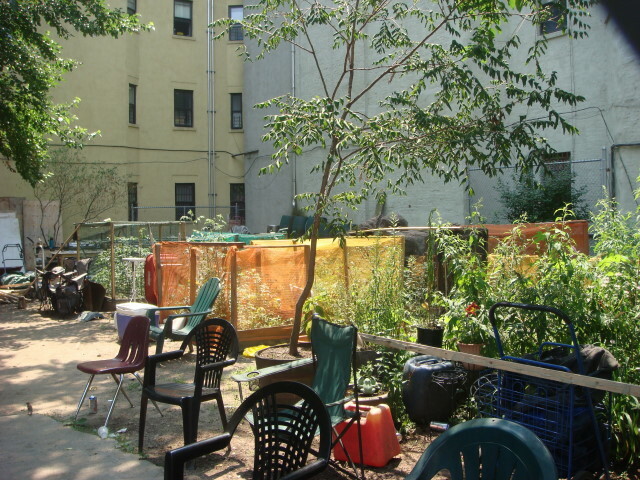 I’ve said it on this blog many times: NYC is filled with community gardens. Small and intimate, many of these are the work of a handful of volunteers and communities that want to have some small part of nature in this town. Yeah, we’ve got Central Park and a dozen other big parks; but there’s great pleasure in having a pleasant area all of your own…you and a few thousand of your neighbors. 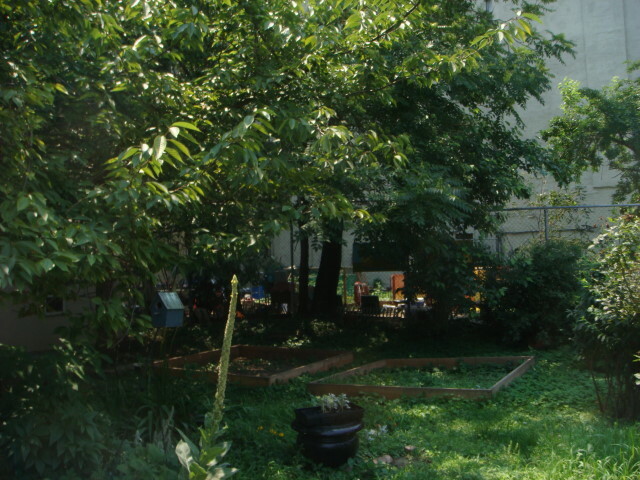 In Spanish Harlem, on Pleasant Avenue are several of these gardens. And, of course, I went to ’em all. This first one is called Pleasant Village Community Garden. It’s somewhere around 119th Street or so. According to a nearly ruined sign on the exterior fence, it was created between 1978 and 1982 by Rose Gardella. However, it seems to have taken until 1997 to become a park. The area of Harlem I was walking through was pretty deserted that day, but each of the gardens had people there. That’s the mark of a pretty good thing, I would say. 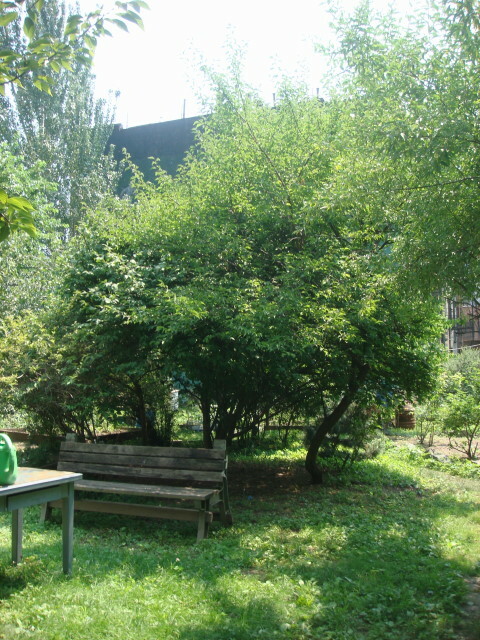 As I always love to point out, NYC parks (and gardens) generally have lots of places to sit. All in all, this place really wasn’t a regimented garden. Stuff grew here and there. One thing I liked about it was the surrounding buildings. They looked pretty run down, but you don’t sneeze at a view of a garden in NYC, so I’d call the residents pretty fortunate to have one. And speaking of the gardens, this was one that seemed to take the idea of a “garden” pretty seriously. There seemed to be a number of individual plots where residents had veggies growing. Now, that’s what makes a real garden. 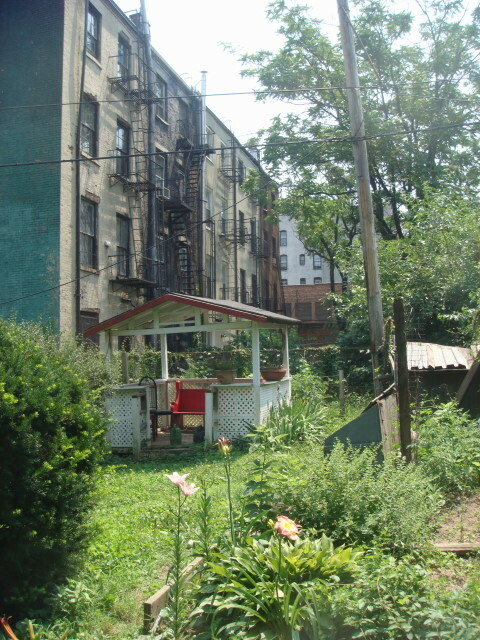 This entry was posted on July 16, 2008 at 6:39 pm and is filed under Harlem, Manhattan, Wanderings. You can subscribe via RSS 2.0 feed to this post's comments. You can comment below, or link to this permanent URL from your own site. No !! they will get killed out there! Those plecas hold the largest crime rates in NY. Tell him/her not to move out there, its not pretty, its dirty, poor, and if they’re racist to spanish and black people that is NOT the place for them (just saying). Try plecas like:-brooklyn heights-bayridg-forest hills-kew gardens-long island Was this answer helpful? One Other important factor of an automobile insurance QuotesChimp is the component that safeguards the significance of your car. This area of the deal is named wreck protection and its particular price is all about one third of the overall cash outlay for the plan. Anyway I will be subscribing on your feeds or even I fulfillment you get admission to persistently rapidly.